Getting the feeling of grass underneath your feet while in the shower or bathtub. Most grass bath mats or shower mats on the market today are not actually made from grass but are constructed out of more durable and innovative materials that are designed to simulate the refreshing feel of natural grass beneath your feet. They can also be an extra safety feature in your handicap shower environment by reducing the chances of a slip and fall. Besides the practical reasons you might purchase a mat, grass shower mats can make your time in the shower a heavenly experience where thousands of fine bristles stimulate your senses and act like your own personal foot massager soothing sore feet after a long hard day. Grass bath mats offer several benefits over other types of traditional bath mats, and come in a wide variety of sizes, colors, patterns, and materials to choose from so you are sure to be able to find one to fit your taste, décor, or any tub or shower stall size. Prices vary widely, but a typical grass bath mat sells for $10 to $25. Here are three products that might suit your needs for a grassy bath mat. 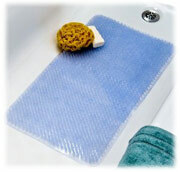 Grass Pad Shower Mats – This one has the appearance of a grass mat with nylon grass. Soft Grass Bath Mats – Highly reviewed soft fiber grass feeling bath mat. Feels very soft on your sore feet. If you want a grassy feeling bath mat, this is it. Vinyl Grassy Bath Mats – Soft grass bath mat offers your feet a nice massage and scrub. Advantages to grassy waterproof shower mats include the ability to better scrub your feet with all the stimulating blades of grass that also relax tired muscles throughout your entire body, ease of cleaning with constant draining action and the ability to simply wash and hang them for the next use, and grass mats won’t block water from flowing down the drain like many other mats. When shopping and comparing the different grass mats available, look for ones that are packed with the most bristles which serve as mini foot scrubbers and massagers. Other desirable features include having adequate holes for drainage so your feet rinse well and you don’t slip on water buildup, a skid-resistant surface with suction cups, and materials that resist mildew. 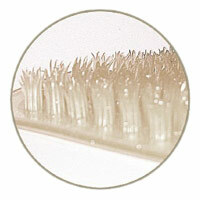 If you’re sensitive to chemicals or have allergies, you may want to look for latex-free materials, as well. So if you want to pamper and indulge yourself while relieving stress at an affordable price, consider investing in a luxurious grass bath mat. If you do, you’ll soon find yourself imagining you’re outdoors in the Spring rain walking on a bed of soft lush grass as you wash your cares down the drain.